An inside view of the heart of the Eagle Nebula, captured by the Herschel space telescope on Oct. 24, 2009. A dark cloud at the heart of the Eagle Nebula had goneunseen until the Herschel Space Observatory peered inside for a new look,released today. The nebula is astar-forming region about 1,000 light-years away in the constellationAquila, the Eagle. A light-year is the distance light will travel in a year, orabout 6 trillion miles (10 trillion km). Telescopes had not been able to penetrate the thick darkclouds at the very center of this stellar nursery. 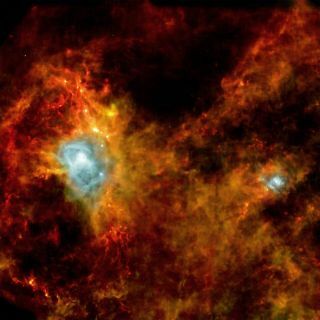 Herschel used itsstrong sensitivity at the longest wavelengths of infrared light to probeinto this shrouded region. The resulting photograph reveals roughly 700 newly-formingstars stretched along filaments of dust spanning the 65 light-year-wide image.The dust and gas in the filaments are at various stages of condensing to becomestars someday. Once they become dense enough to ignite nuclear fusion in theircores, the objects are considered true stars. The two areas glowing brightest in icy blue light areregions where large newborn stars are causing hydrogen gas to shine. The European Space Agency (ESA)'s Herschel telescope was launchedin May 2009 to study the universe in infrared light. The Eagle nebula imageis the first release of ESA's Online Showcase of Herschel Images.